I first shared a recipe for homemade sauerkraut over a year ago, and I’ve had a constant supply at my fingertips ever since. Luckily for me my husband has become a master sauerkraut maker. 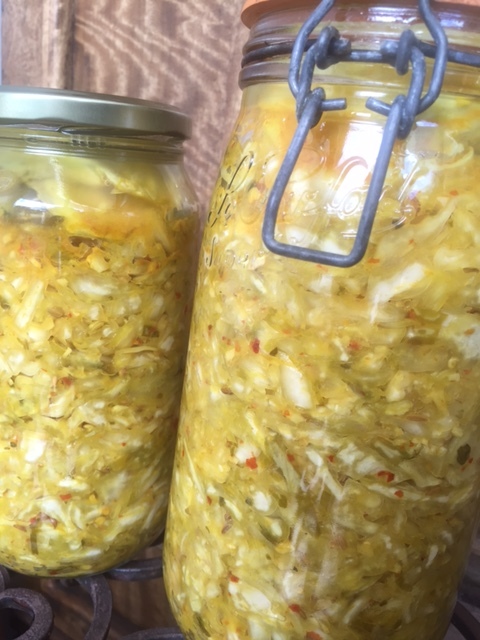 When our supplies run low he turns another green cabbage into a couple of huge jars of sauerkraut – like the ones you see here. What first attracted me to sauerkraut wasn’t the taste – but rather the health benefits. In my earlier post I spoke about how it was starting to make health headlines as a fermented superfood. Now, only a year or so later, I’d take a guess that most health conscious foodies have heard about the wonders of sauerkraut. Sauerkraut, like yoghurt, is packed with good bacteria. Good bacteria, or probiotics, are essential for gut and digestive health. I’ve read a few books in this area and my key take out is that if you look after the flora in your gut then this powerful organ will be home to a balanced microbiome (an army of bacteria) that will look after your body and also your mind. consuming fermented foods, like sauerkraut. If you’re keen to learn more in this space I’d recommend the book ‘Gut’ by German scientist Guilia Enders. I’m sure many people have tried sauerkraut once or twice. But chances are few, outside of countries like Germany and Poland, have made it a regular dietary habit. Even fewer would have discovered just how simple it is to prepare at home. Sauerkraut is simply cabbage and salt fermented, often with spices added to enhance the flavour. Of course you can pick up a jar of sauerkraut in the supermarket. But I’ll bet you won’t find it as tasty as that made with your own hands. Note: Good hygiene is essential when making sauerkraut – before you dive in be sure to have clean equipment (rinse with boiling water), clean hands and sterilised jars. Slice the cabbage into very thin slices with a large knife and then finely chop the slices into small chunks. Transfer the chopped cabbage to a large bowl. Sprinkle the salt over the cabbage and then work the salt into the cabbage with your hands. After mixing and firmly squeezing/crunching the cabbage for a few minutes the cabbage will start to soften and liquid will appear. Mix through the optional spices and allow the cabbage to stand for a few more minutes. Using your hands transfer the cabbage, alongside any liquid, into the jars. Once each jar is ¾ full use a pestle or the end of a rolling pin to press down the cabbage – the goal is for it to be tightly packed and submerged in water. But don’t fill the cabbage right to the rim of the jar. Cover the mouth of the jar with a cheese cloth and secure with a rubber band or string. This allows air to circulate. Place the jar in a cool place away from direct light to ferment. Keep the top of the jar covered during the fermentation period to avoid dust getting in – a cheese cloth allows adequate air flow. During fermentation you need to ensure every bit of cabbage remains submerged in liquid. So bash down the cabbage daily if you can. In the first 24 hours you may need to do this a couple of times. The smaller the batch of sauerkraut the quicker it will ferment – using the quantities here you’ll want to leave it 3 days, then taste it daily to determine when it’s ready- it could take up to 10 days. When it’s ready seal the jar with a lid and consume within 2-3 months. Keep refrigerated once opened. Chop the cabbage finely – large chunks or slices will ferment but the end result won’t be as good. Adjust the quantity of salt depending on the amount of cabbage – a salt to cabbage ratio of 1 tbsp salt for every 700g cabbage is a good guide. During fermentation the brine can spill over the top of the jar – so don’t fill the cabbage right to the top of the jar. And if you do see a bubbly overspill that’s ok – as long as the cabbage remains covered by liquid it’s all good (don’t pour any liquid that escapes back into the jar). Sauerkraut isn’t an irresistible ‘eat it straight from the jar’ food – it really needs a companion like sausages or poultry. It also works well as a sandwich filling and can be added to salads and soups. Tags: benefits, cabbage, home-made, how to make, recipe, sauerkraut. Bookmark the permalink. Thank you Archana – would love to hear how your first attempt goes! Laura, thanks for this post. Great tips!! Interesting! I’ve heard that sauerkraut is incredibly good for you, but I’ve only eaten it a few times myself. 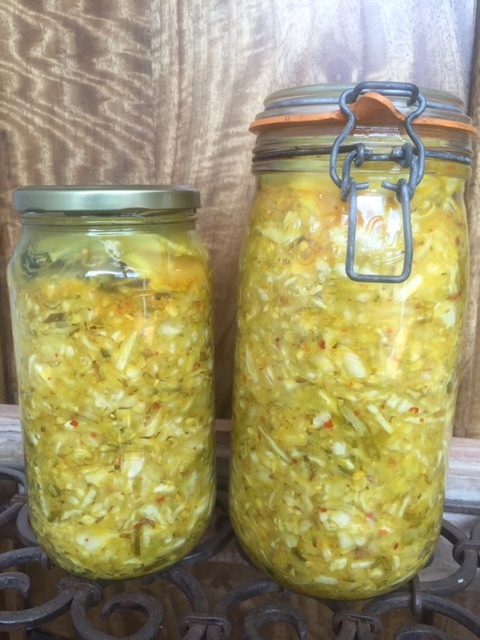 Hi Nell – yes it’s super good for your gut like other fermented foods – and homemade is so much tastier than store bought…. I need to snag me some big jars like the ones you are using in this recipe! I’ve only tried making sauerkraut with smaller mason jars and let me tell you – there is not enough sauerkraut to go around after you make a batch in them! Thank you for posting your article! I hope to make a bigger batch using your recipe soon! Thanks Billy and yes the big one litre are the way to go – it lasts longer and is easier to pack in the cabbage too!